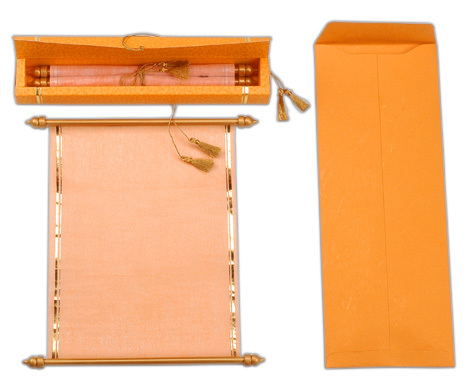 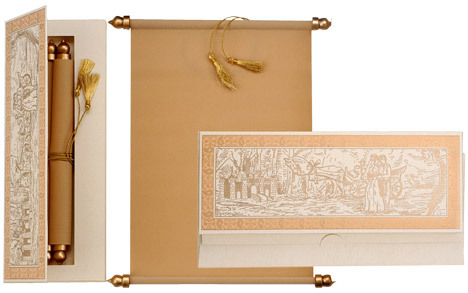 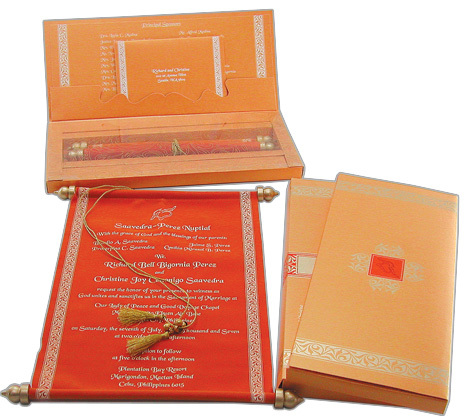 Inserts, RSVP card/env, Mailer box and Scroll container box: orange metallic paper. 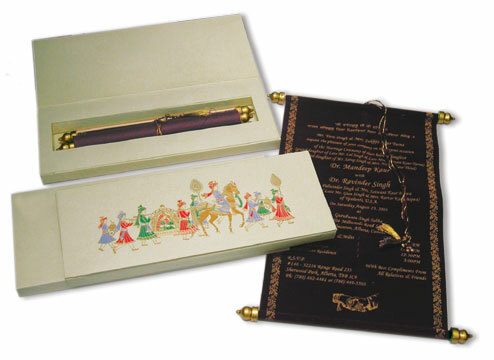 Monogram can be printed on top of the scroll box for a small fee. 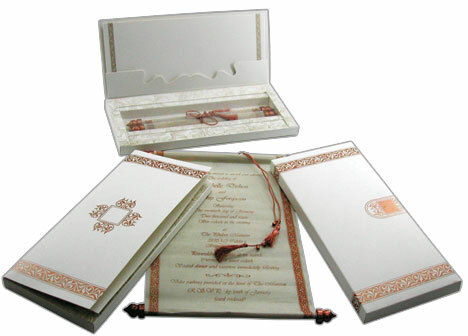 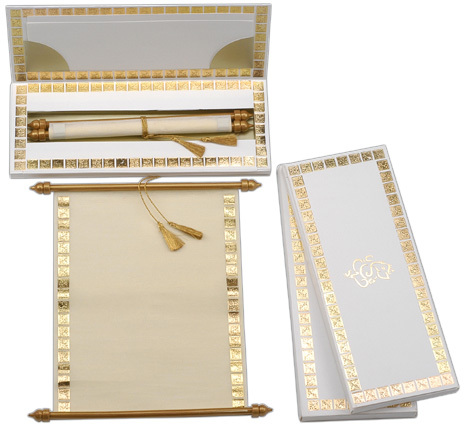 Inserts, RSVP card/env, Mailer box and Scroll container box: Cream color matt finish paper. 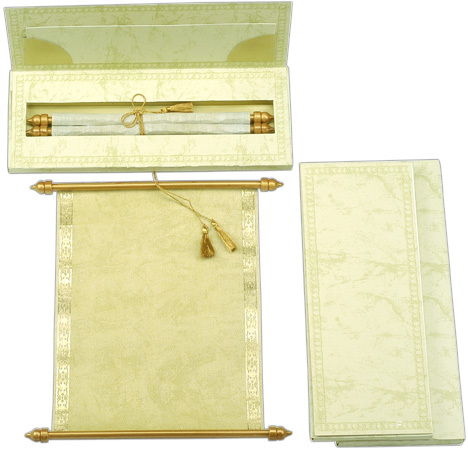 Inserts, RSVP card/env, Mailer box and Scroll container box: Cream paper. 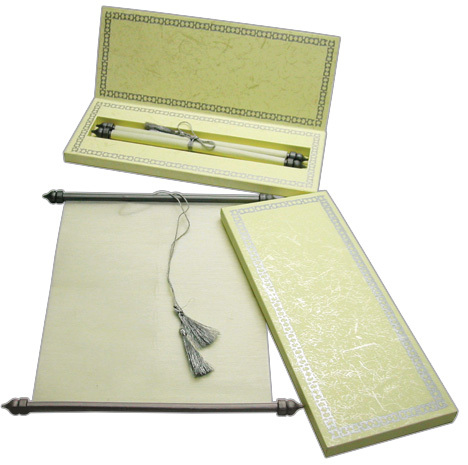 Scroll - White translucent wooly paper; Silver knobs and tassel. 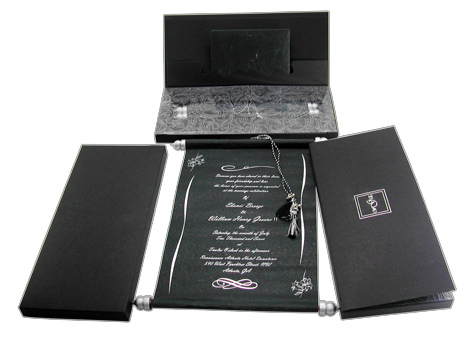 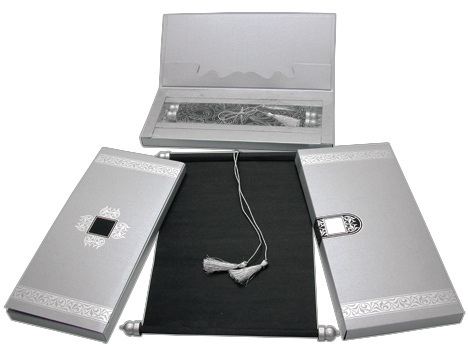 Inserts, RSVP card/env, Mailer box and Scroll container box: Silver matt finish paper. 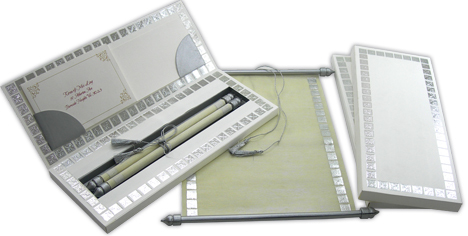 Scroll -- White translucent wooly paper; Silver knobs and tassel. 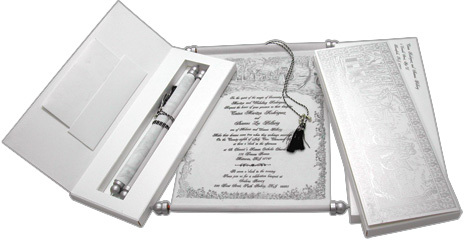 Inserts, RSVP card/env, Mailer box and Scroll container box: White paper. 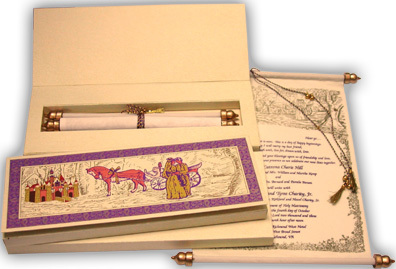 Size : Scroll: 12�8.5 in, Box: 11.25�4.25�0.75 in + Mailing Env. 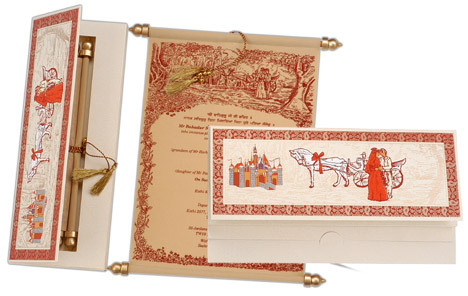 Scroll box has silver Castle Wedding design. 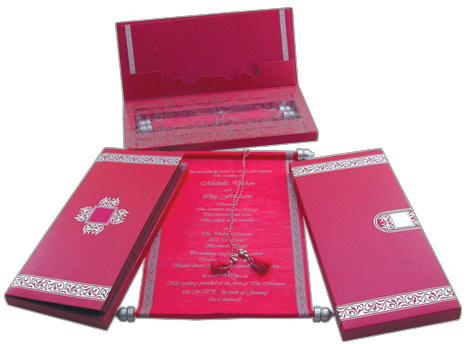 This design can be customized. 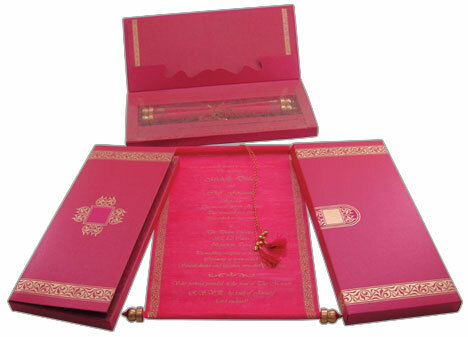 Inserts, RSVP cards, Mailer box and Main Container Box: magenta metallic paper. 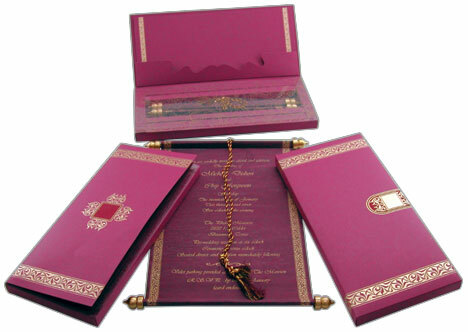 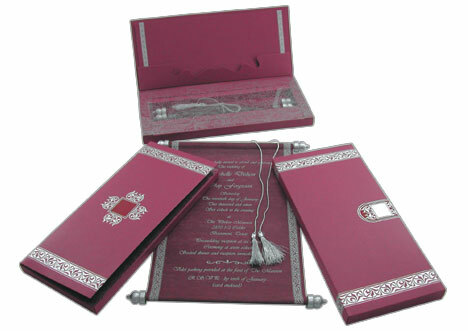 Inserts, RSVP cards, Mailer box and Main Container Box: magenta-maroon paper. 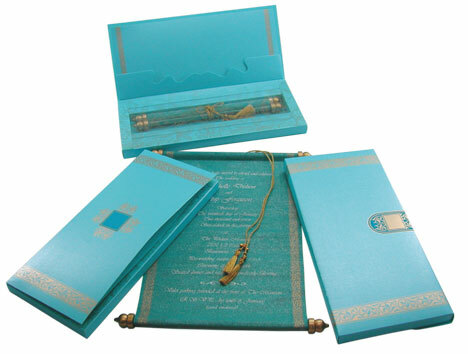 Inserts, RSVP cards, Mailer box and Main Container Box -- Blue paper. 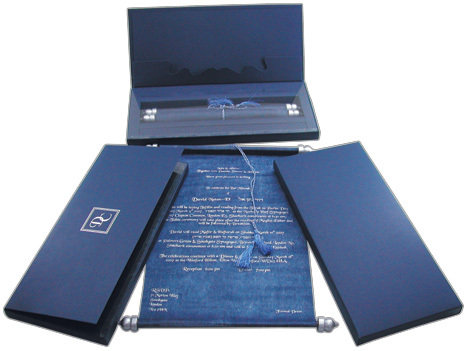 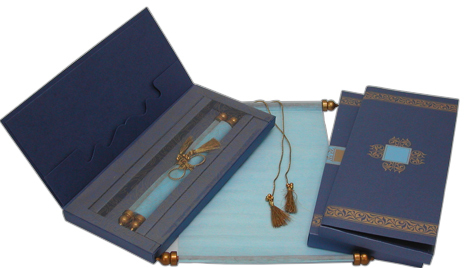 Inserts, RSVP cards, Mailer box and Main Container Box -- Blue Metallic paper. 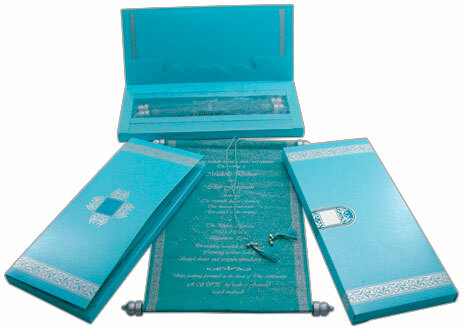 Inserts, RSVP cards, Mailer box and Main Container Box -- Turquoise Blue Metallic Paper. 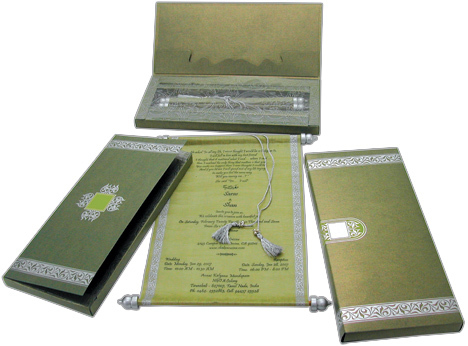 Inserts, RSVP cards, Mailer box and Main Container Box -- Offset Printed Green Matte Paper. 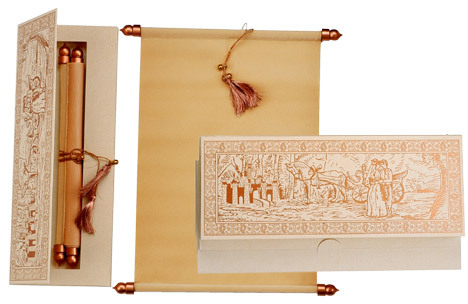 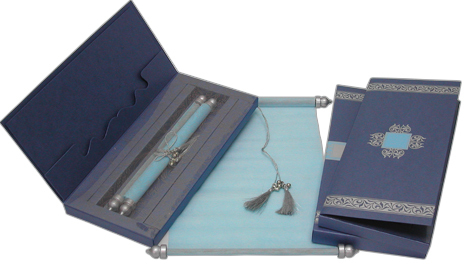 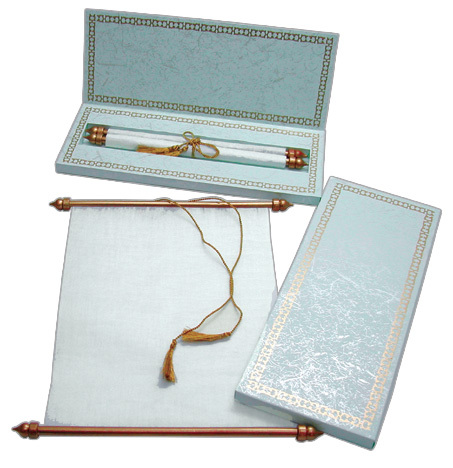 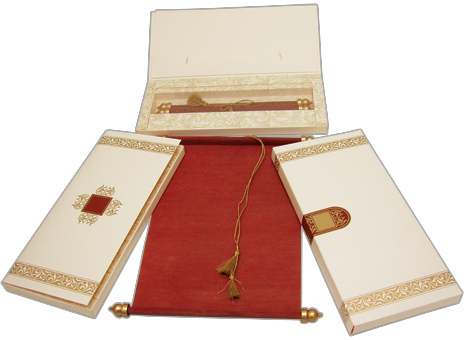 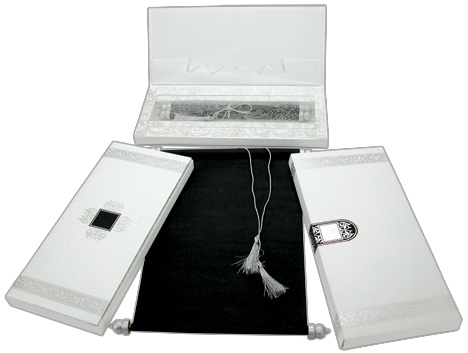 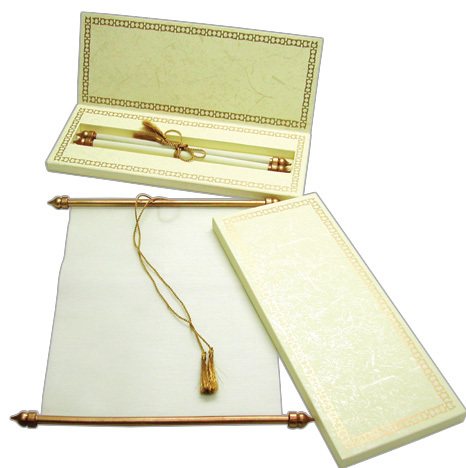 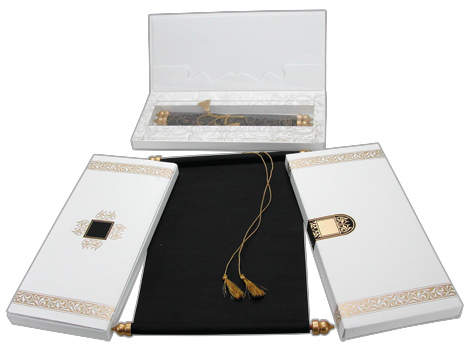 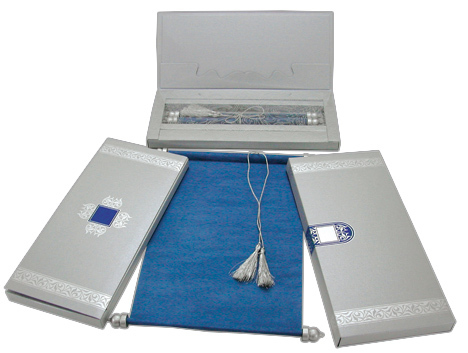 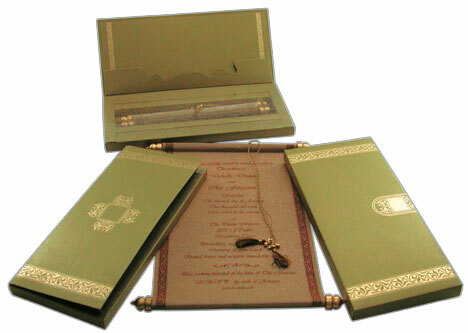 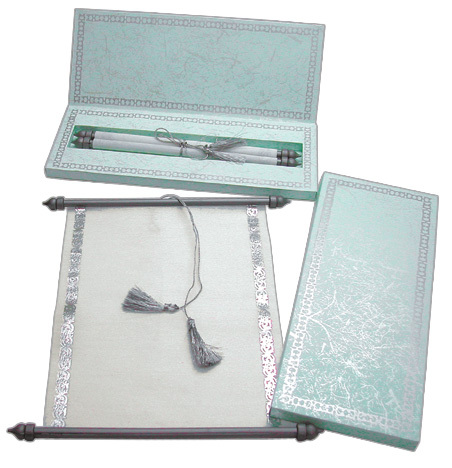 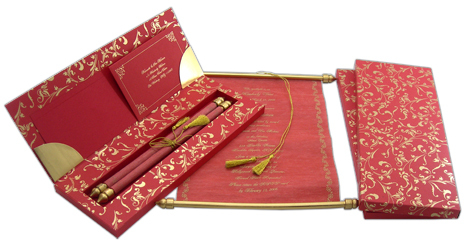 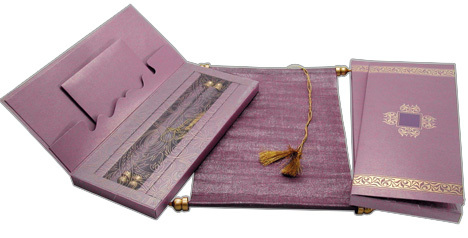 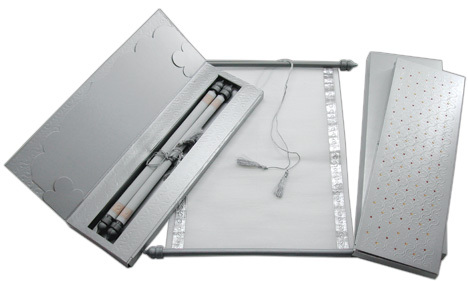 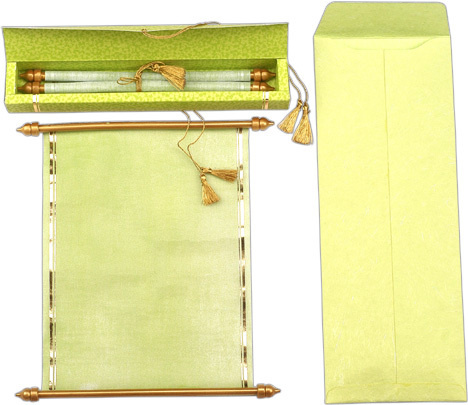 Semi translucent wooly cloth scroll card, scroll box and mailer box with plastic scroll bars and a matching tassel. 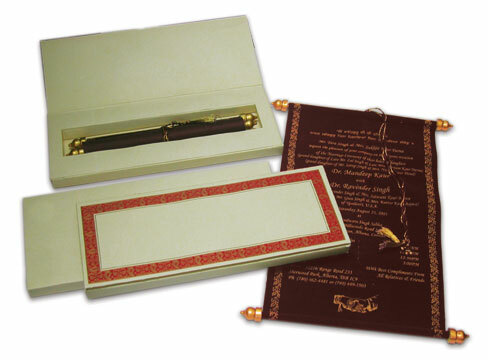 You can print on two inserts that are held on the inside pocket of the top flip of the box. 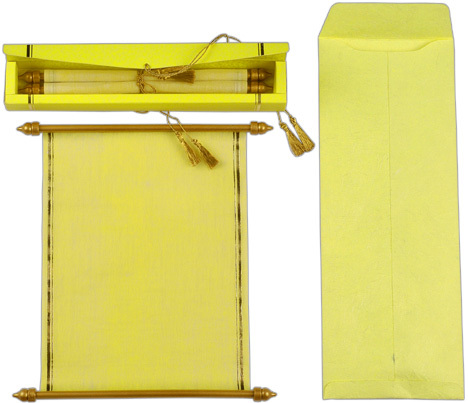 Semi translucent wooly cloth scroll with golden rod, golden scroll bar ends and golden tassel. 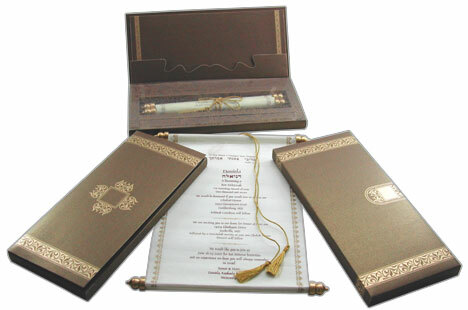 The scroll and the box have gold borders printed. 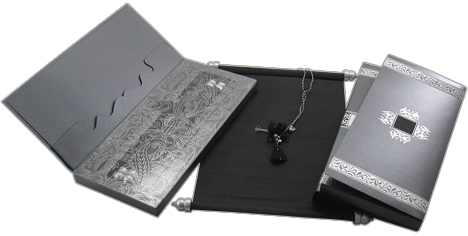 The boxes have a small leaf pattern design.